Every now and then you can see square patterns of dots, called QR codes. These can be scanned with a smartphone, tablet etc. and a QR code reader application will decipher the information stored in the pattern (such as a website address etc.). These codes are ubiquitous, and sometimes even printed with letterpress - mostly using photopolymer plates, but not always. ...and that got me thinking. Making and reading a QR code is an automated process, using complicated but well documented algorithms (involving e.g. error correction, so if a part of the image is corrupted, you'll still get the correct data). Rendering it as a photopolymer plate and printing it is easy, but has a drawback: once you expose the plate, there's no getting it back and re-using. Putting it together by hand is error-prone, and (at least in Jens's case) needs distributing after the work is done. But - I have a computer-controlled Monotype composition caster. What if I could use it for making a letterpress QR code? Generating a sequence of codes and sending them to the machine is no big deal for my hardware and software. I've been doing it for two years now. There are free and open source software libraries for encoding text strings as QR codes; translating white and black squares to different matrices is straightforward. The only possible problem could be making matrices for printed squares, but that's not even needed, because Monotype has taken care of it as early as in 1910s. There's a nice feature of the Monotype system: it uses two different type body heights for spaces. The high spaces were basically type without face, and the low spaces were ca. .2" lower, to reduce the material usage and composition weight, and to prevent spaces from rising to the printing height and appearing on paper. These high spaces are ca. .05" (i.e. punch drive depth for Monotype matrices) lower than the character sorts. If we put some paper, sheet metal etc. under the type to raise the high spaces so they are printed, we can make a pattern of rectangles or squares (in case of em-quads) where the high spaces were, and whitespace where the low space were. 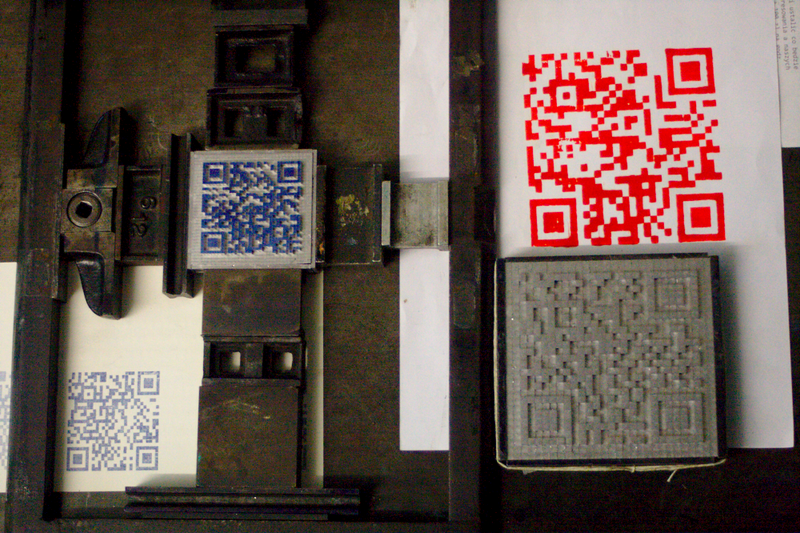 My first QR codes were rather large in size as I cast them on a 10 point Didot mould. A pattern of 30 by 30 squares would be ca. 6" by 6". The experiment was successful: after casting and making a proof print, then scanning it, the information received was the same as what I encoded (a web address of our museum). Some of my teammates even took the metal code to the Typo Berlin conference, where people from all over the world discussed about typography, graphic design, new technologies etc. Here https://en.wikipedia.org/wiki/Movable_type#Type-founding we have a nice overview of some type heights used in Europe. I cleaned it and put it back in the box as I had some other projects at the time and didn't have an opportunity to fire up the caster for a few weeks. Now that John is staying at our museum, we put the mould on the machine, solved some problems (the mould was a bit too loose and got packed with lead; the jet was off to one side and the machine stopped casting after a few sorts), then I managed to cast a successful QR code, put it on a Boston platen and made a few prints. I'm an ex-Linotype man myself, but I can see that the Monotype system cannot really be beaten for its quality and flexibility. The ability to control them by computer just adds another dimension and I'm sure they will be put to good use for many years to come. Linotype & Intertype machines were also computerized in their last days, just to keep up with the changing printing world. Like Monotype UK did too, here the computers were that expensive... and they were only making the paper ribbons. At the Panassia typefoundry of Hans Ulrich Frei up on the mountain in Swiss, a few of those computers (Z80 machines ?) have survived. There is here another thing to be accounted for: the down movement of the due case, when a higher mould is put on the machine, the bridge needs to be readjusted. The matrix case should stop above 2 papers above the seat of the mould, 2 times .005 inch... the last past of the down movement is caused by the center pin in the bridge. A full Dutch height type (.987") would not fit in the type carrier on this french height machine. a Dutch high space meets: .987" - .050" = .927" and this is quite near French height = .928"